The Snow Flake Fingerless Gloves are finished! 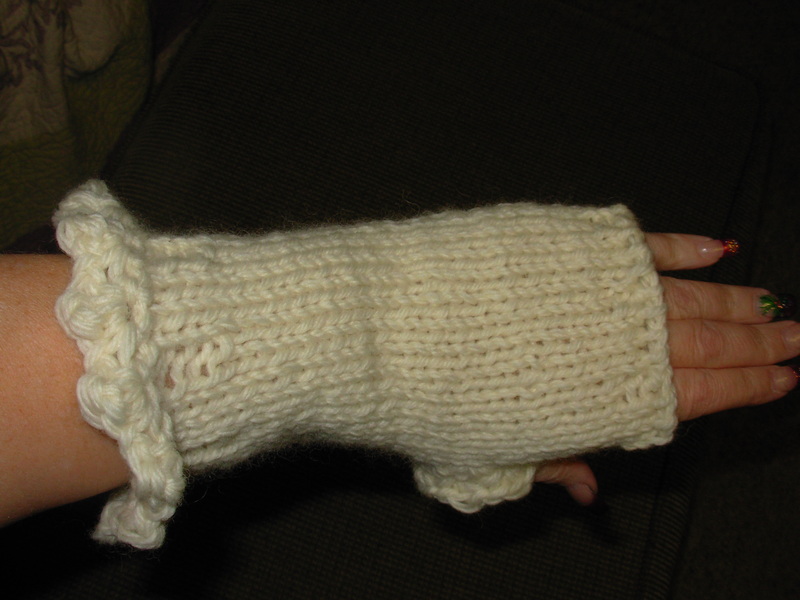 Knit public side, purl private side until glove reaches desired length from cast on to thumb. For this pair, it was 19 rows. End on purl row. On appropriate row (Row 20 for this pair) cast off 3 stitches at beginning of row, Knit to end of row. Knit on public side, purl on private side until glove reaches desired length from top of thumb to fingers. For this pair, it was 6 rows. Next 3 rows, K2xP2 rib. Bind off, leave very long tail for closing gloves. Whipstitch inside of glove down to thumb decreases, stitch around thumb making sure to go through top of BOTH sides of stitch – not through both sides of thumb. 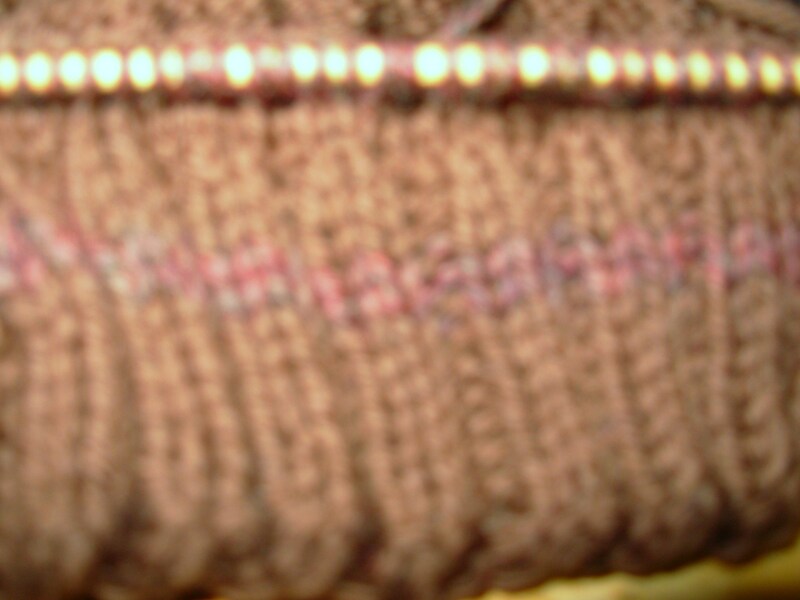 (Stitch through the top of the knit stitches.) Continue whipstitch down remainder of glove. Join yarn at bottom ribbing of glove. Crochet Row 1: Single crochet fairly loosely in every OTHER stitch around – note… it is best to crochet through the knit stitches as much as possible, crocheting into purls can create a bit of a gap (see picture above). Chain 1 join together. Row 2: Chain 1, continue around (do not go back, go around) *in top of next single crochet, single 1, double 1, single 1, chain 1* repeat from * around. Bind off. Thumb crochet row 1: single crochet around thumb stitches. Chain 1 at end, join together. Row 2: Chain 1, continue around (again, do not go back, go around) *in top of next single crochet, single 1, double 1, single 1, chain* repeat from * around. Bind off. I got a bit done on Dad’s hat last night. It’s a variation of The Fisherman’s Hat. Instead of 1×1 rib, it’s 2×2 for 14 rows then I’m doing stockinette stitch for the ‘body’ of the hat. The yarn is a stash busting brown for the main and heathered red/brown for random-ish stripes. If there’s enough time before gift-day, I may make a couple more, Will might want one – he sometimes wears beanies when it’s cold. I’m getting a bit frustrated – I can NOT find the Christmas socks. We had to move everything out of the main floor bedrooms (mine, David’s and Marci’s) into the kitchen then back again while the carpets were being cleaned and somehow I seem to have mis-placed them. I’ll look again later on. Right now I’m going to drink some green tea and act like a miserable blech for a bit. Marci wants some deep purple socks so I ordered the yarn yesterday. Yes, Knit Picks again. I chose Risata as it is more of a year-round weight, easy to work with, and – most important of all – had the right purple. Her first round of final exams is this week. It’s difficult to get my head round my daughter is old enough to be doing finals and have finished her first semester at university. This morning I woke up with a slight fever, horrendous headache, post nasal drip and accompanying sore throat, the freaking cough got worse overnight, left ear hurts, my head feels like it could possibly explode, don’t touch my face please, total body ache – yep, I’m sick. I made myself get up, shower, do hair, get dressed, trying to psych myself into the whole “if you just get going, you will feel much better thing,” but had to stop at makeup. My elbows and wrists just hurt too much, my face hurt too much, blah blah blah. Sometimes one just has to admit defeat. Yesterday as I was ravelrying the roomate commented on how much time I spend searching knitting and reading books online. Hello?! I’ve been home an average of 2.5 non sleeping hours per day the last few weeks except for this last weekend. Even then, I was gone for a significant chunk of time. I read books online because I like to read and have no more room for books. Then he asked why I would write up knitting patterns or print out other peoples patterns. Knitting is so straightforward why would someone need directions? wtf dude?! Yeah… colorwork, cables, lace, size modifications, personal preference modifications, etc. are so easy knitters just magically know how to do them. This from someone who apparently hasn’t left the house for more than half an hour all week and sleeps about 15 hours a day. I get the not riding his motorcycle in the snow thing but really?! You can’t find someone to give you a ride to work? (He hasn’t been to work in over 3 weeks so far as anyone knows.) You work for your brother for heavens sake. okay, whatever. Yeah, I’m the one home sick today. oops! Anyway…. enough of that. Vent/rant is over. 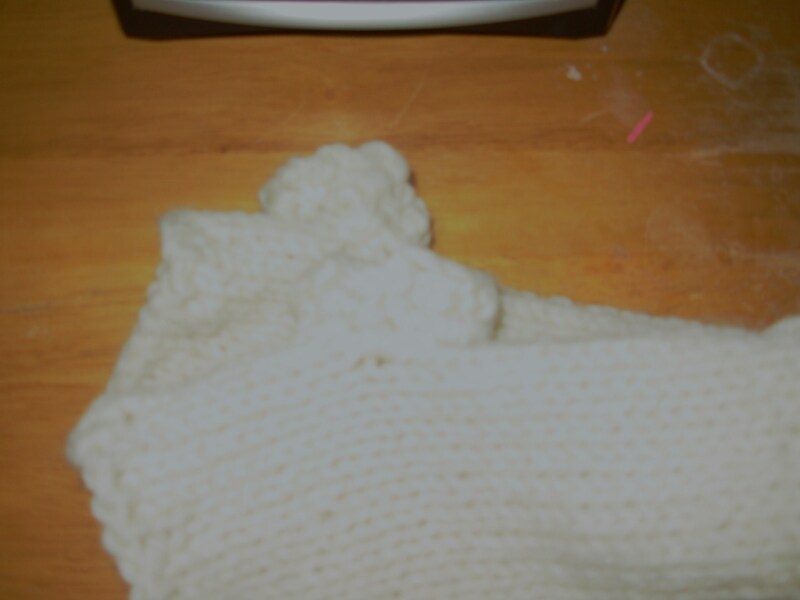 This entry was posted in knit, knit pattern, Knitting, my free patterns and tagged fingerless gloves, fingerless gloves pattern, free knit pattern, Free pattern snow flake fingerless gloves, knit hat, knit picks risata, Snow Flake. Bookmark the permalink.